For the first time ever, vegetables and plants that make it to our dining table are among the star attractions in Gardens by the Bay's signature floral display in the Flower Dome. Titled 'Christmas Sugar Mountain', the display features 2 main characters - a pineapple boy called "Ananas" and a strawberry girl "Berry". I have to say those 2 are the cutest things... but Ale outranks them in terms of cuteness anytime of course. Heh. But back to the floral display. This Christmas whimsical creation is a first-time collaboration between Gardens by the Bay and international landscape designer, Kazuyuki Ishihara, a multiple gold medallist at the prestigious Chelsea Flower Show. And instead of using the usual flowers and other plants to brighten up the Flower Dome, 'Christmas Sugar Mountain' cleverly banks on edible produce such as strawberries, pineapples, pumpkins, capsicums, tomatoes and lots of cabbages, woven together with a magical story of love, hope and joy. My only gripe? How come no durians???? Ok, so I am nitpicking. And in case you are wondering, there is actually a story behind this floral display! The story tells of the tale of Ananas and Berry, who both have to live apart because of their different growing conditions. One day, they stumble upon a garden with a special mountain that provides for all their needs. And in this paradise of theirs, they build a home and live happily ever after. No doubt it is a simple story. But this stems from the designer's belief in the power of food to bridge the disparities in society and to allow children better discover the omnipresence of plants in much of the food we consume. For me though, the cute little truck that was draped completely in green was the highlight of the display. And being Christmas, a display devoid of the unmistakable red and green foliage of Poinsettia would be criminal. Perfect atmosphere to get into the festive mood... just ask Ale. And if you are intending to head on down with the kiddos, be sure to download the The Wonderful Map of Wise Wyatt too! 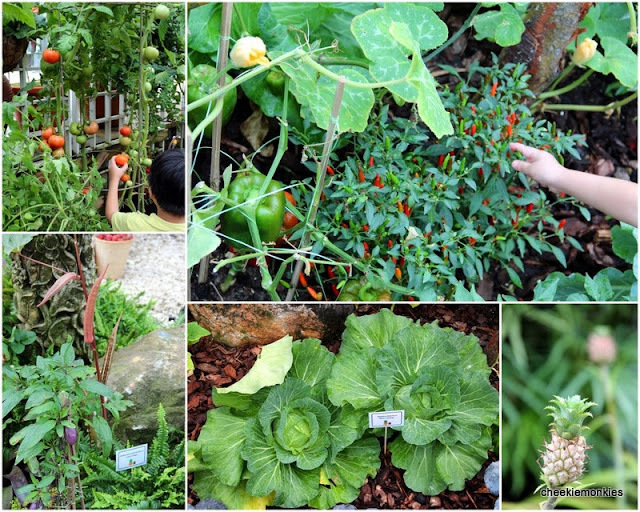 Created by Wise Wyatt, the Gardens' Bear Botanist, this map for children aged 4 to 6 years old is filled with simple and fun activities that introduce children to some of the places in Gardens by the Bay, as well as some of the plants in the cooled conservatories. Download the trail map HERE before you go!